Does it fill you with so much excitement that you chatter on and on – or do you just look at me with frustrated eyes and groan? Lots of kids don’t like to write – whether it’s physically cumbersome or the ideas just don’t flow easily. Many parent’s don’t feel comfortable enough with writing themselves to find the confidence to teach it well. Writing is so subjective and personal that it can be hard to grade. Because people are often sharing so personally in writing, there can be fear that giving grades or even suggesting edits might lead to hurt feelings. But, much like math and reading, writing is integral to almost everything else we do. That makes it a super-important homeschool subject that we have to tackle whether it’s easy or fun…or not. I’ve told you many times before that I don’t teach formal writing until 5th grade. Most children younger than that are still working too hard to form letters on the paper and are still learning how to easily spell common words. Not to mention, it takes quite the educational maturity to be able to think through things like plots, characters, and settings. I’ve also told you many times before about my seemingly never-ending quest for the perfect homeschool writing curriculum. I’m picky. I don’t want a lot of fluff. I don’t want a lot of busy work. Yet I want a thorough curriculum that covers everything from the writing process to sentence structure. 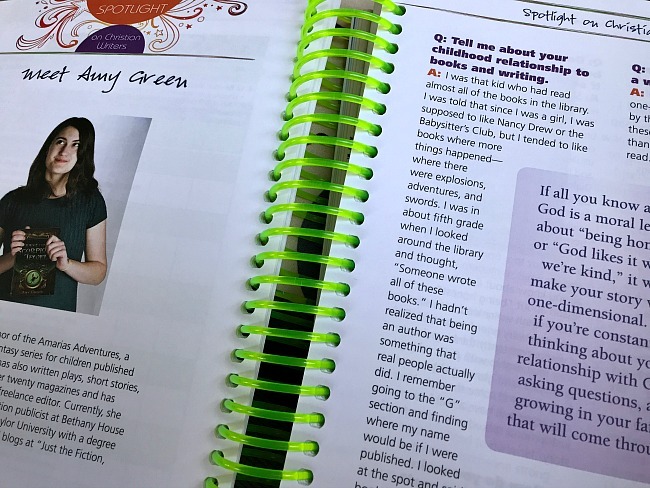 I believe I’ve finally found a keeper – that also happens to help with those four things that give homeschoolers fits with teaching writing that I mentioned above! I received a full set of Writers in Residence, Volume 1: Apprentice for free in exchange for an honest review and I have been compensated for my time spent preparing this post for you. I was in no way obligated to write a positive review. All opinions are strictly my own. There are affiliate links in this post. Because they publish superior curriculum, Apologia has been a well-trusted name to homeschoolers for years. I’m happy to introduce you today to one of their newest products to earn a spot in our curriculum line-up…Writers in Residence, Volume 1: Apprentice by Debra Bell. The contents are Christian, like all other Apologia curriculum. 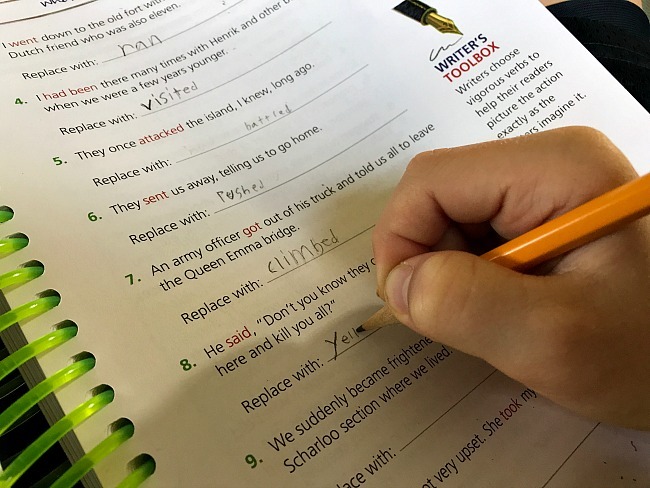 It’s a “writing-focused language arts program.” In other words, through the mode of writing lessons, it also teaches grammar, punctuation, sentence structure, and word usage. A suggested daily schedule (based on 4 days/week) keeps us on track to finish the curriculum by the end of the year. There are six units. Each unit covers a variety of language arts skills and produces one final draft of writing. Students learn to write really great sentences, a creative story, a research-based writing, an opinion essay, an autobiography, and a short story. The daily lessons are currently taking us less than 30 minutes to complete. Each day’s lesson is a little different. One day we might edit a few sentences, work through a handful of grammar exercises, and use a thesaurus to revise boring words. The next day we might simply write. And, another day might find us working through a checklist to inspect and improve the writing. You all know that I’m a huge fan of using examples from master writers to teach kids how to write well. I was SO pleasantly surprised to see that Writers in Residence uses lots and lots of mentor texts as well! 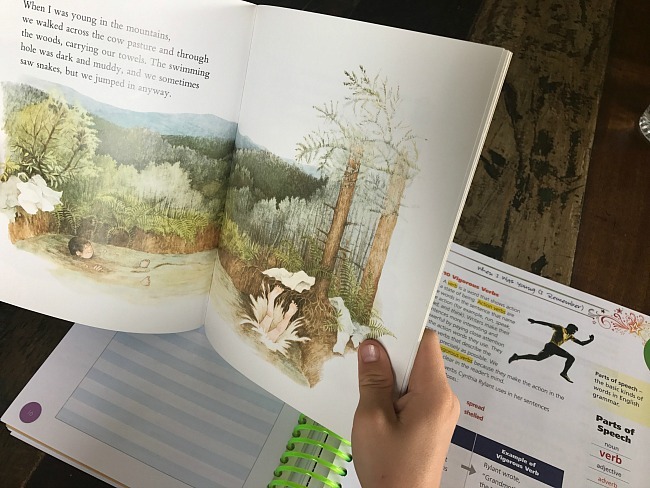 Before many of the assignments, there is a snippet of wonderful literature that serves as an expert model of the particular skill, style, or other lesson being taught. Learning from expert writers makes. a. difference. Additionally, each of the six units begins with a spotlight of a Christian writer which includes a Q&A interview. These spotlights have really grabbed the attention of my son – and they make great connections between apprentice writers and the experts! I love how the Q&A interviews answer questions like how the author began writing, whether or not he or she loved writing as a kid, and some of their techniques for writing professionally. It’s all very encouraging for budding writers. A rubric is a tool often used by teachers to help students know what is expected from an assignment. Once the assignment is complete, the same rubric serves as a grading tool for the teacher. I LOVE using rubrics with my children because we’re all on the same page about an assignment from the beginning. Your children can think of a rubric as a checklist of sorts. You can think of a rubric as an easy way to grade objectively. Rubrics are also a great way to encourage children to self-assess their work before turning it in to you, too. 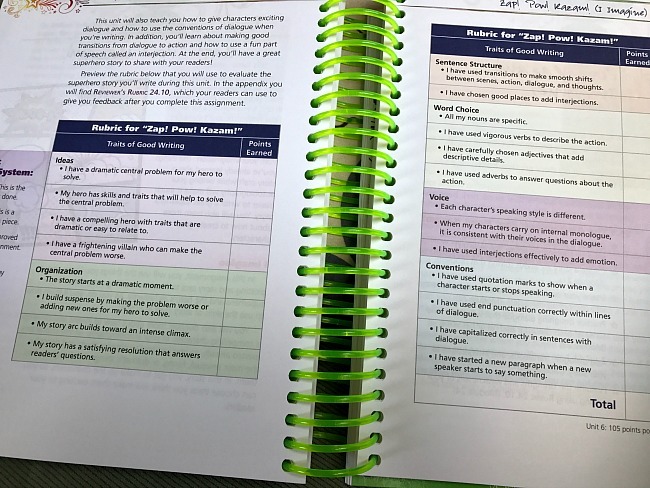 Remember, one of our goals in homeschooling is to develop independent learners – and rubrics are great for training independence. 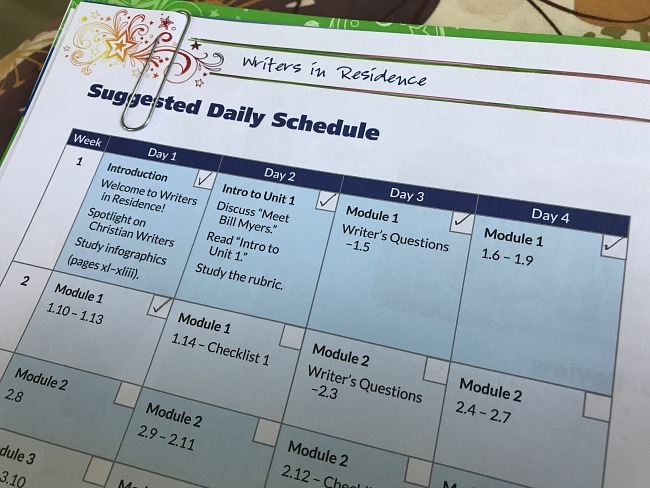 There are rubrics for self-evaluation and teacher evaluation all throughout Writers in Residence! Notice from the two pictures of rubrics (above and here) how expectations in the rubrics grow as the curriculum progresses. While each unit’s ultimate goal is to produce a final writing draft, there are so very many language arts skills being taught, too. 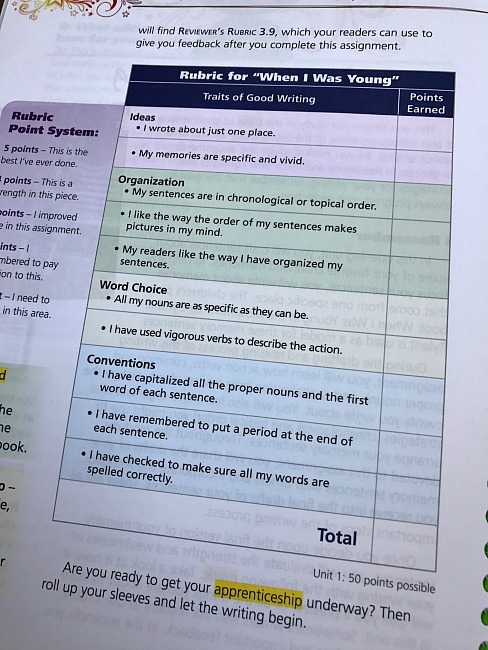 These various skills are introduced in order to help specifically with the writing task at hand, but they are presented more subtly. I almost consider them to be “brain breaks” from the writing. Let me try to explain. After reading some mentor text one day, my son had to write several sentences in the style of the author. There was a fair amount of writing that day. 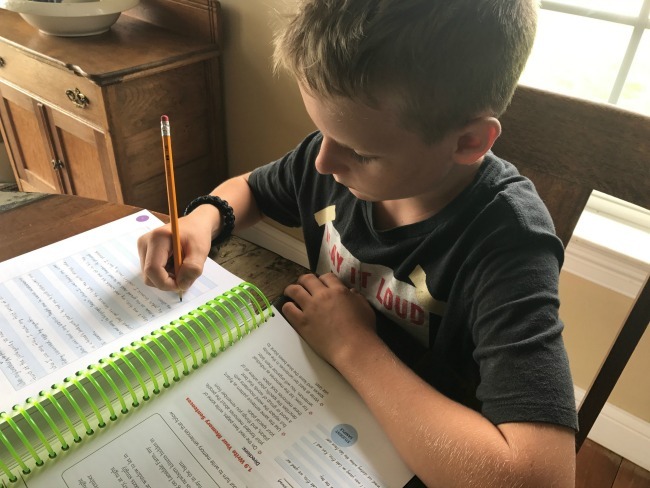 In order to improve the quality of his sentences (eventually), the next day’s lessons focused on using a thesaurus to replace some boring verbs with “vigorous verbs.” In other words, he wasn’t burdened by a second day in a row of writing. This particular kid of mine would be so resistant if every day of the curriculum expected loads and loads of writing. Instead, he’s much more amenable to our daily lessons! I think I should emphasize again the number of skills that are woven throughout the year. They build on each other beautifully and strive to create better writers with each new introduction. Take a look at this list and realize that I probably missed some things! 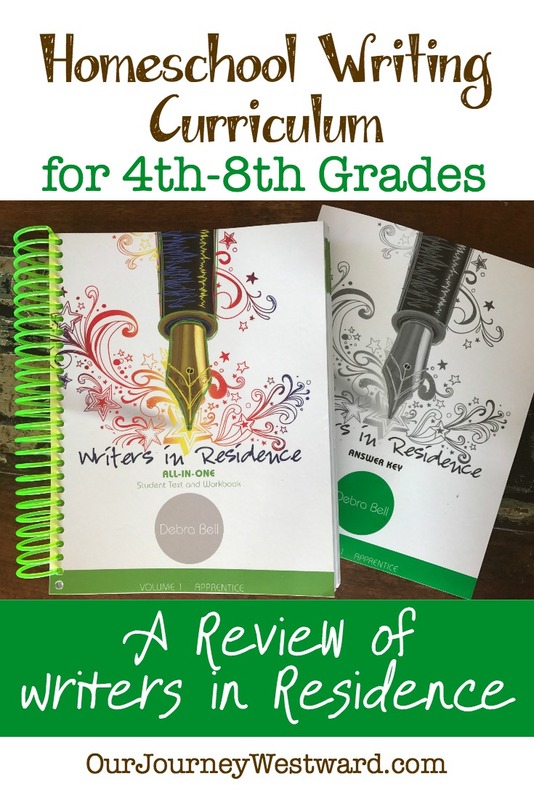 I love the thoroughness of this homeschool writing curriculum! We are using a separate spelling curriculum and our morning time includes a little grammar and vocabulary practice. Otherwise, this covers all we need for 5th grade language arts. See a large sample of the curriculum and read some of the F.A.Q.’s to see if Writers in Residence is right for you. I can’t wait to hear what you think! Thanks for reviewing this! I have been looking into this (a little late into my planning process) and there is a facebook live program tonight on Volume 2. Looking forward to checking it out! Thank you for this review! Do you feel the answer key is a necessary purchase?